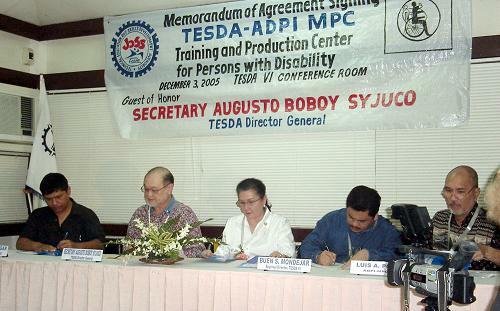 The Technical Education and Skills Development Authority (TESDA) and the Association of Disabled Persons - Iloilo Multi-Purpose Cooperative (ADPI-MPC) will sign today (December 2) a memorandum of agreement for the establishment of a Training and Productivity Center for Persons with Disabilities (PWDs). The agreement allows the ADPI-MP C the use of the extension workshop space of the IFMA-TESDA Training Center building with its existing amenities located inside the compound of TESDA Regional Office 6 at Zamora St. of this city for ten years and renewable as needed. The ADPI-MPC is a primary cooperative of persons with disabilities that aims to provide livelihood opportunities to its members. One of its income-generating projects aside fr om their Canteen and Massage Center in Jaro Plaza and Micro-Finance project is a productivity center in Sta. Barbara, Iloilo. The Productivity Center produces different assistive devices for PWDs such as prosthesis, crutches, wheelchairs and other mobility aids. It also manufactures elementary tables and chairs and secondary armchairs. The center supplies the Department of Education (DepEd) and private schools with these products. ADPI-MPC General Manager Mario Abaygar said this generous move of TESDA is a big help to their organization since their contract with the landowner where their productivity center in Sta. Barbara is situated is about to expire. He added that what is also important is the training component that goes along with the transfer. 'What we also value is the assistance that TESDA will provide to us in the technical aspect especially on how we could improve the production of our chairs', Abaygar said. Expected to lead the signing is TESDA Director General Augusto Syjuco. A new breed of Ilonggo workers are currently entrusted with government projects that call for the making of some 25,000 steel school chairs. Year back some of them spend their days as beggars, left with no other recourse because of their disabilities. A multi-million contract with Persons With Disabilities (PWDs), the deal was realized back in August 26, 2004, thanks to the National Federation of Cooperatives of Persons With Disability (NFCPWD). The contract is for the supply and door-to-door delivery of steel-based secondary armchairs. Yet what made this more than just the regular government procurement are the workers tasked for said supply and the door-to-door delivery. To date, the men and women of the Association of Disabled Persons In Iloilo or ADPI particularly those with the ADPI Multi-Purpose Cooperative are directly in charge with the bulk of said order placed at 10,200 units. With cross disability mostly polio victims, vision-impaired and blind, deaf-mute, have dwarfism and those with cerebral palsy, these Ilonggo workers are silent heroes who have all redefined Ilonggo craftsmanship. And within them, sparked a revolution of change in their quest for a productive life and recognized right for a regular life. 43 year-old Bob Flores of Mandurriao, Iloilo City is one of the three designated supervisors. A polio victim, Bob who may be orthopedically-handicapped sees no problem making his rounds here and there. Quietly yet with seeming precision, Bob wheels in his wheelchair looking through the painting job of young women ADPI members in their late teens to early 20s. All deaf-mute yet loudly sending the message in every neatly-painted wood that will make for the back rest of the steel chairs. Bob also checks with that ready smile to fellow polio victims engrossed in welding jobs and a group of happy faces of ADPI colleagues, all with dwarfism working through their task of piling up more woods. The ADPI steel workers found refuge in the TESDA Regional Office where government support was extended for the group and welding course scholarship embraced by the members. TESDA Regional Director Buen Mondejar in an interview said TESDA is most happy and willing to link up with the hardworking ADPI men and women. Those without the skill TESDA provided the scholarship. Mario Abaygar, National President of the NFCPWD correspondingly serves as the General Manager of the ADPI Multi-Purpose Cooperative. "I am most happy to have helped made them self-reliant and productive partners of the society and the government. This is the legacy I am leaving them," Mario said. "And it brings me great pride to bring these chairs to students from far-flung barangays. What an honor to be part of their education. "From sanding, to cutting, from bending to welding, from grinding to painting, from transfer and delivery, ADPI power is there that ensures an average output of 60 steel chairs per day. Alfredo Gumaquil, former town councilor of Pavia who lost a leg serves as the very able supervisor of the transfer and delivery of the finished steel chairs. Like Bob, he makes his rounds in the TESDA workhouse quietly as he prods on the vision-impaired worker, guiding him through the waiting delivery truck. ADPI’s skills are also for making of wheelchairs, crutches and prosthesis for its members and those who needs one for family members faced with physical disability. The ADPI. Silent heroes. Ordinary men and women leading extraordinary lives and great examples to the Ilonggo community. This is what life is all about -- perseverance and shining Ilonggo spirit. The ADPI. Their appeal -- opportunity not pity. Their vision -- to establish a sustainable, productive and committed organization, to unite, guide and lead the total development of persons with disabilities in Western Visayas. 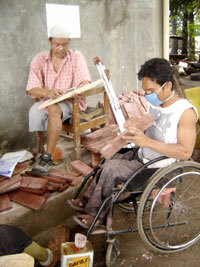 Their mission -- to integrate the PWDs into society.